It is Speedy Tuesday today, which means it is our recurring topic: Speedy Tuesday! Every week we pick a Speedmaster and put it in the spotlight here at Fratellowatches. This week, we have the follow-up model of the Speedmaster we covered here two weeks ago (click here). Our reader, who would like to stay anonymous, has this wonderful Speedmaster Professional Pre Moon ref.145.012 model that he purchased from the son of the original owner. 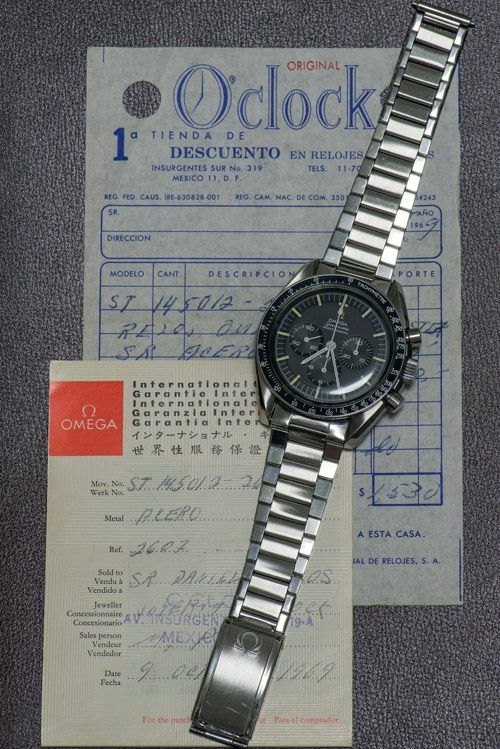 The Speedmaster Professional Pre Moon watch was originally purchased on October 9th, 1969. Just a couple of months after the Moon landing. This Speedmaster Professional Pre Moon watch is complete with all documentation (and receipt) and its original red leather box. The fact that this particular model was already out of production on the date that the first owner bought it, makes me wonder how long this watch was lying around in that store and why it didn’t sell. It is unthinkable these days that a brand new Speedmaster Professional lies around at an Omega dealer for so long. This watch has seem some services according to the owner, but has been stored away most of its life. We hope that the current owner will wear it more often and makes sure it stays in the same condition as it is now. On the photo above you see the original red leather box (reference 1501 box) that belongs to these particular Speedmaster Pro Pre Moon models. 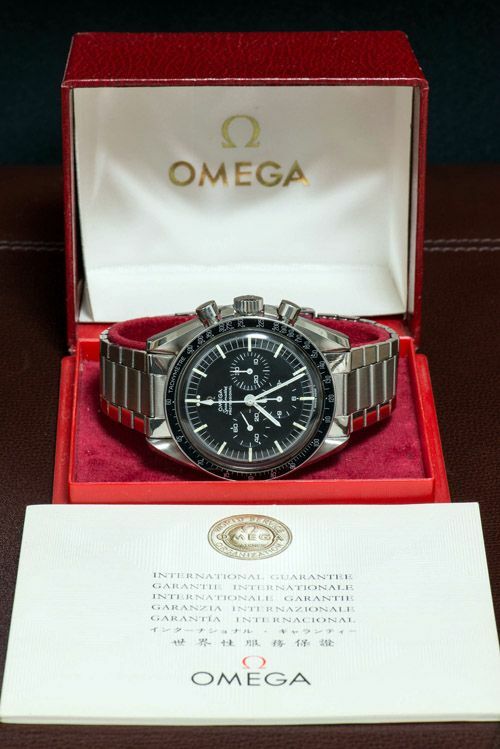 Besides the original invoice and international warranty booklet there is also the booklet that proofs authenticity of the watch as it contains the matching serial number, reference number (also referred to as case number) and the name of the Omega dealer. In those days, they also noted the name of the watch buyers. Below you see a photo of the beautiful Lemania based caliber 321 movement with its column wheel chronograph mechanism. Besides the caliber number, the movement also contains the serial number that belongs to this specific watch. Later on, Omega started to engrave the serial number in one of the lugs as well. 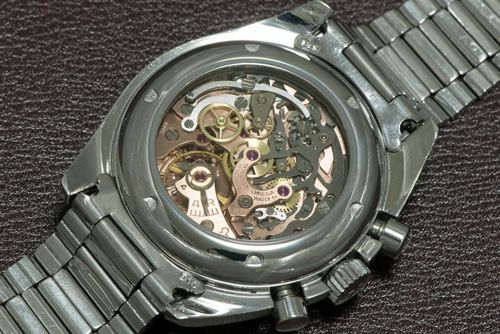 The Omega caliber 321 movement was replaced by the caliber 861 cam shaft chronograph at the end of 1968. This week’s contributor wrote: “The fact that the watch looks just as great today as it must have when the original owner walked into the store in 1969 is a real testament to the design. A true icon!” We couldn’t agree more! 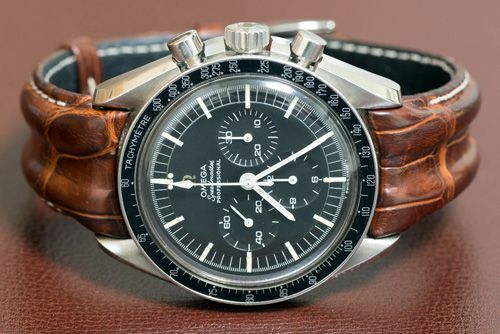 It is a wonderful Speedmaster Professional Pre Moon with its original ref 1039 bracelet, box and papers.